The flag of Tenerife is prescribed by a Decree adopted on 9 May 1989 by the Government of the Canary Islands and published on 22 May 1989 in the official gazette of the Canary Islands, No. 70, p. 1,988 (text). Flag: Blue with a white cross whose arms reach the corners of the flag, in the shape known as St. Andrew's saltire or cross of Burgundy. The colour shall be sea blue while the white saltire shall be approximately 1/5 of the flag's width. According to José Manuel Erbez (Banderas y escudos de Canarias, 2007; website), the flag was established on 30 June 1845 as the register flag of the Maritime Province of the Canary Islands. When the province was divided into two parts in 1869, the flag remained as the flag of the Maritime Province of Santa Cruz de Tenerife, being eventually adopted as the flag of Tenerife in 1989. The choice of the design was completely arbitrary. The only purpose was to distinguish this flag from other Spanish register flags. Accordingly, it has nothing to do with the flag of Scotland, even if a local legend claims such a connection. An official state tour guide told that the flag was taken when Admiral Nelson was beaten in battle and surrendered his ship's flag he gave the St. Andrew's flag instead of the Union Flag, so as not to offend the King of Britain (report by Alastair Hudson, 8 August 2009). The coat of arms of Tenerife was originally granted to San Cristóbal de La Laguna by Royal Letters signed on 23 March 1510 by Queen Juana the Mad, and subsequently adopted in 1912 by the newly created Island Council of Tenerife, with a minor change in the motto for the sake of differentiation and the addition of two palms beneath the shield. "Or an island vert surmounted by a volcano proper emitting fire over waves azure and argent surrounded dexter by a castle gules and sinister by a lion of the same and ensigned by an Archangel St. Michael proper holding a pear in the one hand and a shield in the other hand. A bordure gules inscribed with 'Thenerife Me Fecit Cabildo Insular de Tenerife' in letters or. Beneath the shield two palms proper. The shield surmounted by a Royal crown open." The coat of arms recalls the incorporation of Tenerife to the Crown of Castile and its evangelization under the protection of St. Michael. The motto reads "Tenerife Made Me. 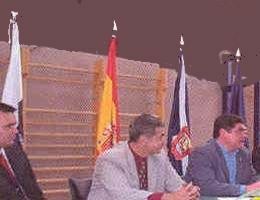 Insular Council of Tenerife". The flag of Tenerife is sometimes used with the coat of arms in the middle (photo), seemingly without the palms beneath the arms. 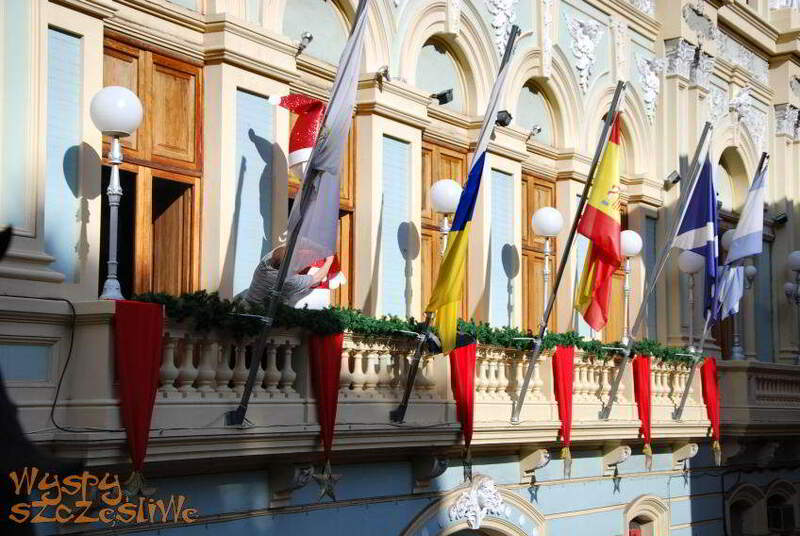 A vertical flag of Tenerife, in proportions 3:1, was hoisted from a staff with horizontal bar in the port area of Los Christianos. Círculo de Amistad XII de Enero (website) is a civic and patriotic assotiacion of craftsmen, focused on cultural and leisure activities. El Recreo was established on 2 August 1855 in Santa Cruz de Tenerife, Cirilo Romero serving as its first president. The youth from the upper middle class established on 13 September 1855 a rival society, El Progreso. Close to extinction, El Progreso was renamed to La Aurora in 1857. The rivalry between the two clubs was so vivid that they organized their respective balls on the same day, at the same time. In 1861, the presidents of the two societies agreed to celebrate the balls on different days; this allowed Infante Enrique María de Borbón to attend the two balls during his stay on the island, in 1865. Círculo de Amistad was eventually established on 13 March 1868 as the merger of the two rival circles. The circle operated a theater, where performances were continued for more than one century. Conferences were organized, while poets read their works on a weekly basis. Balls were a main source of entertainment for the youth of the town. Círculo de Amistad became the main cultural forum of Santa Cruz. On 14 July 1892, a blaze destroyed the theater; the circle's new seat was also destroyed by a blaze that broke out on 11 November 1902, suppressing all the archives and documentation relative to the circle. In September 1903, Círculo de Amistad merged with XII de Enero, a circle based in El Toscal. The new name of Círculo de Amistad XII de Enero was officially adopted on 30 October 1903. In 1998, the circle counted 7,000 members. The flag of Círculo de Amistad XII de Enero, hoisted in front of the central seat of the circle (photo), is horizontally divided blue-white-blue (1:2:1 - the blue stripes are said to be each 1/4 of the flag's height, the white stripe 2/4). In the white stripe is fetaured the circle's emblem, surrounded by two golden stars representing the two social seats of the circle: Sede Capitalina (main seat, Santa Cruz de Tenerife) and Club Deportivo (sports club, Candelaria).